You may update, correct or delete information about you at any time by logging into your online account and modifying your information or by emailing us at Reply@ExitPromise.com. We will retain your personal information for the period necessary to fulfill the purposes outline in this Privacy Notice. If you wish to deactivate your account, please email us at Reply@ExitPromise.com, but note that we may retain certain information as required by law or for legitimate business purposes. We may also retain cached or archived copies of information about you for a certain period of time. We will respond to your access request within 30 days. We will retain personal data we process on behalf of our customers as directed by paying customers. Exit Promise® will retain this personal information as necessary to comply with legal obligations, resolve disputes, and enforce our agreements. Upon request, Exit Promise® will provide you with information about whether we hold, or process on behalf of a third party, any of your personal information that we are aware of. To request this information, contact us at Reply@ExitPromise.com. You may opt out of receiving promotional and newsletter emails from Exit Promise® by following the unsubscribe instructions provided in those emails. You may also opt-out of receiving promotional emails and other promotional communications from us at any time by emailing Reply@ExitPromise.com with your specific request. If you opt out, we may still send you non-promotional communications, such as security alerts and notices related to your access to or use of Exit Promise® services or those about your online account or our ongoing business relations. The information you provide is used to fulfill your specific request for information or for membership. This information is not shared with third parties except with our sponsors for the purpose of serving advertisements. We use e-mail addresses to answer the e-mail we receive from you, and to send you newsletters or other information which, based on your interaction with our website, we believe may be of interest to you. Such addresses are not shared with third parties. When you become a member of Exit Promise®, you will receive our newsletters as well as other information and offers of services. Information you submit on our website will be used for providing you with those benefits of membership. E-mails, newsletters and other electronic forms of communications from Exit Promise® will allow you to opt out of further outbound communications. We may use non-identifying and aggregate information to better design our website and to share with information contributors. For example, we may tell an information contributor, or one of our affiliates, experts or sponsors, that x number of individuals visited a certain area on our website, or that y number of women filled out our subscription form, but we would not disclose anything that could be used to identify those individuals. Protecting the privacy of the very young is especially important. The Exit Promise (sm) website is designed for those over 18 years of age. For that reason, we never collect or maintain information at our website from those we actually know are under age 18, and no part of our website is structured to attract anyone under age 18. You can access all your personally identifiable information that we collect online and maintain by logging into your membership account and making any changes you may desire. We use this procedure to better safeguard your information. You can correct factual errors in your personally identifiable information. 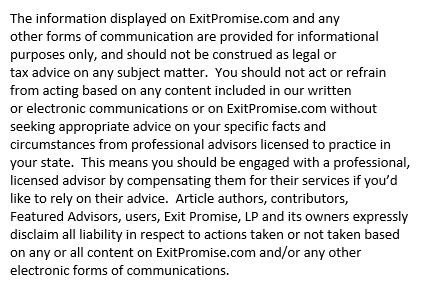 Should you have other questions or concerns about these privacy policies, send us an e-mail at Reply@ExitPromise.com.